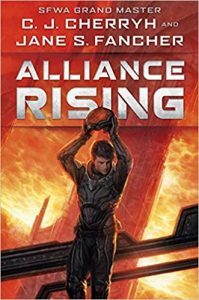 Alliance Rising is the first novel to be published by the partnership of SFWA Grand Master C.J. Cherryh and her wife, author and artist Jane S. Fancher. It’s also the latest novel to be set in Cherryh’s Alliance-Union continuity, a literary universe that incorporates novels like Downbelow Station and Cyteen, as well as many others. 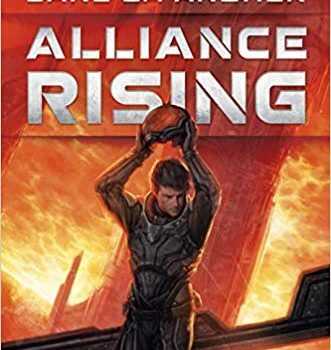 Until I read Alliance Rising, my major – in fact, my only – exposure to Cherryh’s work came via her long-running (19 volumes and counting) Foreigner series, which may or may not take place within the same universe as the Alliance-Union continuity, but which is, at any rate, occupied with a very different set of concerns, and I had no previous exposure to Fancher’s work at all. After I read Alliance Rising, I went out to sample a se­lection of the Alliance-Union books – which says positive things about Alliance Rising‘s ability to engage my curiosity about its wider world – partly because I found Alliance Rising intriguing, and partly to have a basis for comparison when I came to discuss it here. Alliance Rising appears to be set very early in the Alliance-Union continuity, even before Downbelow Station (which I haven’t read). It sets itself on Alpha Station, the closest of the space stations to Earth, but a station that is functionally quite isolated: travel from Earth to Alpha Station takes ten years by slower-than-light transport, because, to date, no one has discovered a jump point that would allow FTL travel between Alpha Station and Earth. Meanwhile, the stations of the Beyond have effective independence from Earth Company, which remains in charge of Alpha Station, and they have their own integrated econo­mies, supplied by family-run FTL ships, including some new very large ones, while only a handful of small, elderly FTL ships call regularly at Alpha Station. For the last several decades, instead of shipping out foodstuffs and trade material from Earth to Alpha Station, Earth Company has been shipping pretty much only construction material, to build their very own giant FTL ship – a giant FTL ship that’s something of a white elephant, since its crew have no practical experience and its first trial run had to be aborted. Alpha Station has had to rely on the independent stations and worlds for supplies, rather than Earth, because of this long-running project. And several people suspect that the giant FTL ship, the Rights of Man, is not being built for trade. Earth Company and the Rights of Man project at Alpha Station has hired a large number of stationers into security jobs, and some people feel that it’s likely that Rights of Man was designed for power projection, rather than for economic development. Unsettling Alpha Station and its powers, several ships arrive from the Beyond in close succession – including Finity’s End, first of the giant FTL ships to be completed. Captained by James Robert Neihart, Finity’s End has a reputation, and Neihart and his cohorts from the Beyond have arrived at Alpha both to investigate the Rights of Man and to present the ships that serve Alpha Station with a new proposition, one that could be the genesis of a true Merchanters’ Alliance. Meanwhile, crew on the Galway, the newest of the ships serving Alpha Station, are suspicious of the motives both of Earth Company and its representatives, and of Finity’s End. And Stationmaster Ben Abrezio, caught between his responsibilities to Earth Company and his responsibilities to the people of his station, is sitting on incredibly disruptive knowledge in the form of a potential set of jump points that could cut the journey time to Earth to less than a year. In Cherryh’s solo novels, the extent to which she can be said to be writing a literature of, so to speak, “dramatic administrative bureaucracy” is notable. Cherryh’s interest in the anthropologi­cal scale, the social and cultural dimensions and the slow-moving microdynamics of change, so vividly present in the Foreigner series, is shown here in a different and purely human guise in this collaboration. Alpha Station is a station on the cusp of change. That change might be positive or negative, but it’s coming. Cherryh and Fancher examine the stresses and tensions that such changes brings, through the lens of characters like Ross Monahan, a junior navigation officer from the Galway; like Stationmaster Abrezio, caught between impossible demands and competing priorities; and like J.R. Neihart, who has a vision for the future that may well be better than the past. 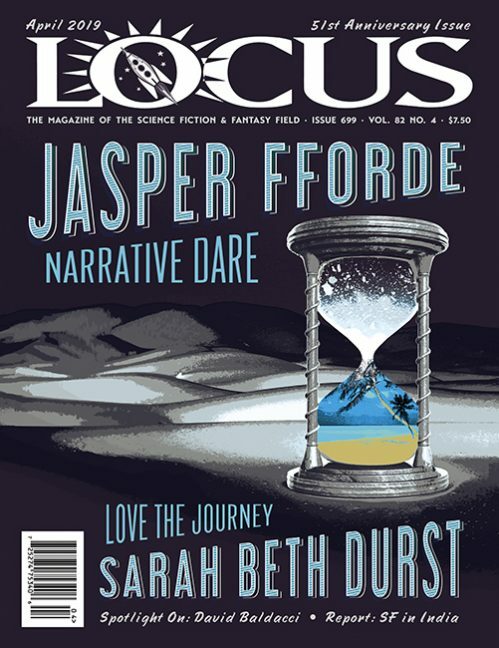 These characters are well-drawn, and finely sketched, with believable motivations. This is a measured, compelling work that’s clearly leading in to a wider arc. Many questions are raised here that aren’t answered yet, and the conclusion drops the reader off with cliff-hanging verve. I enjoyed Alliance Rising enough to seek out more work in this continuity. I’ll look forward to seeing if Cherryh and Fancher make a satisfy­ing sequel.